Trina first came to the Sahtu Region nine years ago when she decided to take a leave of absence from her full time position in Newfoundland. 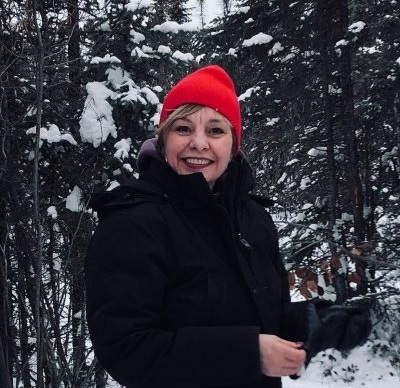 Now a full time Job Share employee with the Northwest Territories Health and Social Services Authority (NTHSSA) – Sahtu Region, she hasn’t looked back! She chose to come to the Sahtu Region based on the positive comments work colleagues had said about the area, and the autonomy afforded by a broadened scope of practice as a Community Health Nurse was appealing to her. It was also important to her to feel connected to a community. Trina is a proud mother of two sons and is also a grandmother. She is family-orientated and loves the outdoors. In Tulita, she feels at home. I enjoy the natural surroundings and the ability to access nature. Its beauty is breathtaking. As well, I enjoy the security of being in a small connected community where everyone knows one another. People are friendly and always willing to help. I have had occasions where I have been at a client’s home and a passerby will ask if there is anything they can do to help, and sincerely mean it! That speaks volumes. I also enjoy trying to learn a few words of North Slavey from the elders when I can. My coworkers work as a team. We deal with issues as a group to come up with creative solutions. They are a true asset to the community. Like others who choose to practice north, Trina values the opportunity to contribute and to make a difference as a team, and to work at the top of her scope of practice. Trina loves the challenges and complexities of nursing, and the fact that there is always something new to learn and someone new to meet. The Sahtu Region has afforded her the perfect place to grow in her nursing practice.